Bakery Industry: Is White Bread Losing Its Popularity ? What Are Various Food Packaging Symbols ? Is White Bread Losing Its Popularity ? What more evidence one want to see that white bread has fallen from its once most sought out bread for even the street hawker for snacks ( tikkiwala) gives option for multi grain, brown or whole grain bread instead of white bread . White bread which are mass produced are made of wheat flour devoid of bran and germ which are removed while passing through milling process.White bread flour thus doesn't have dietary fibre , iron ,Vitamin B and micro nutrients such as thiamine,riboflavin and niacin . 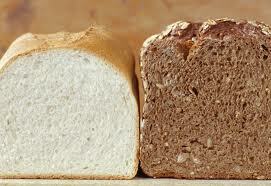 However many countries have food laws making white flour fortification with these nutrients mandatory ( Fortification of bread is not present in Indian PFA act ) .Another important nutrient is folic acid .Removal of bran and germ gives wheat flour a longer shelf life thus making it popular among bread manufacturers . Consumers are now more health conscious than ever before with information available easily to majority population on advantage of whole grain breads . Availability of options to consumers for white bread by manufacturers who are now producing breads such as whole grain , multi grain breads (.Manufacturers like Harvest Gold and Bonn have introduced healthy options of whole grain breads ). Health-conscious consumers are driving a trend toward wholegrain and nutrient-laden bread varieties, steadily eroding the popularity of white bread.Sales of breads enriched or fortified with nutrients are growing by 10 to 15 per cent a year, with more than $320 million in sales, a Bread Manufacturing in Australia report by IBISWorld found. For the first time in 15 years, the U.S. Department of Agriculture is proposing new standards for school meals - ones that call for more whole grains and fresh fruits and vegetables, fat-free flavored milks, limited servings of potatoes and starchy vegetables, and reduced amounts of sodium and calories. Whenever you replace white flour with whole grains—in bread, cereal, pasta—it’s a strike against aging. Soluble fiber, found in oats and barley, has been linked to lower levels of insulin and bad cholesterol (think: diabetes and heart disease), and insoluble fiber in whole wheat reduces risk of gastrointestinal maladies like diverticulosis. Check out bread made with the new albino whole wheat—it tastes like the real white thing.